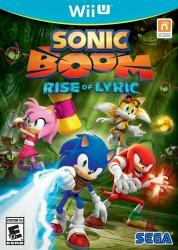 In Sonic Boom: Rise of Lyric, Sonic and his friends Tails, Knuckles and Amy encounter an ancient tomb sealed deep within an island, where they come across a powerful snake-like villain named Lyric. The group must put aside their differences and work together as a team to save the world from Lyric�s evil plan and his army of war mongering robots! They will race across ancient ruins, the depths of the ocean and even back in time� This may be their biggest adventure yet. Do you have what it takes to help Sonic and friends defeat the evil mastermind?